Getting a feeding tube removed is supposed to be a time for celebration. We waited four long years for my son Spencer to be tube free. We had his feeding tube removed on March 6th, 2014, in clinic with his GI doctor. In theory, the stoma was supposed to close on its own, or leak a tiny bit and need surgical closure a couple weeks later. However, with Spencer, nothing ever goes as planned. He ended up in immense pain, with a two-week hospital stay, and with a central line before his stoma was finally closed. We were so excited to get his feeding tube out! Spencer became a tubie due to complications from his genetic syndrome, Say Barber Biesecker Young-Simpson Syndrome. He was born with a cleft palate, cranio-facial muscle weakness, and airway malformations. He had an NG tube placed on his first day of life. When it became apparent that his feeding issues would be long term, a G-tube was placed when he was a month old. He worked so incredibly hard to learn how to eat, and shortly before his fourth birthday we knew he was ready to have his tube removed. The tube removal went as planned. His GI took his tube out and put a Mepilex dressing on it. The doctor told us if it was still leaking a bit after two weeks we would plan a surgical closing, but he was quite confident that it would close on its own. I was skeptical and knew surgery was likely since he had his stoma so long, but we could handle a surgical closing if needed. I changed him from his Super Tubie shirt to a Super Tubie Graduate one and took pictures celebrating his epic achievement. His site looked good and was getting smaller. The next morning, I changed his dressing. He had a meltdown and his stoma opened completely back up. It was spewing stomach contents. We fed him small meals, to minimize leakage. My primary goal was to keep his site clean and dry, which was becoming more and more challenging. His site was starting to get a little red and angry, but it showed promise of closing. Spencer had his tube removed on a Thursday. I called his GI on Monday morning for advice, and we tried putting Maalox around the stoma. By that evening I was ready to drive him back to the hospital. His skin was looking worse and worse. He couldn’t eat anything without it leaking from his stomach. I called the GI doctor on-call on Monday night, and was told to call surgery and GI in the morning to come up with a plan. He had tried to find someone who would close it for us that night, but there were no surgeons available to do so. I felt comfortable waiting as Spencer had finally fallen asleep. The next morning, I called surgery and GI. Surgery told us to go to a local hospital and get a Foley catheter inserted in to the stoma and put cream on it. I told them their plan wasn’t good enough and to inform the departments that I was driving him in to their ER, which is a three hour trip. Spencer had hardly had anything to eat since his closure and I was fed up and wasn’t waiting any longer. In the waiting room at the ER, Spencer was thrashing around in pain and was overpowering me. Just as I asked for someone to help me, they took us back to a room. Upon examination, the GI gave me two options. They could admit him for the night and try to stabilize the skin by placing a catheter, or they could stretch his stoma so they could place another G-tube until they could perform surgery. At the time, I didn’t want Spencer to go through the pain of having the stoma stretched, and part of me didn’t want another feeding tube in him. After the doctor reassured me that a Foley catheter would hold him over until surgery, we decided to place the cath and admit Spencer, in hopes that a surgeon would be available to close the stoma in a day or two. The GI doctor was optimistic that surgery wouldn’t send us home without closing the stoma. It turns out he was wrong. After multiple conflicting messages and very poor communication from the surgery team, Spencer was discharged. He would come back in a week to see his surgeon and have his surgery. If I could do it all over again, I would have had them stretch the stoma because I regret the decision I made. Unfortunately, the Foley catheter only worked for one day. By the next night we were in the local ER because stomach acid was spewing around it and eating his skin. We waited in the ER for four hours before he was seen. By the time we got back to the room, he hadn’t eaten anything for the most part of the day and his skin was completely eaten away around the catheter. A surgeon finally saw us, and I cried when they agreed to help us, even though Spencer had only seen by that hospital’s surgical team a handful of times. It really felt like if I drove him back to our main hospital, that no one would help us. We were told they wouldn’t be able to surgically close it until Sunday or Monday, as it wasn’t emergency surgery, and his doctor was out of town because of a family matter. While she was out of town, she was still very much on board. She was in constant contact with her team, and they sent her pictures. The team couldn’t get the stomach acid under control, and it started leaking out from under the bandages and dripping on Spencer’s leg. The whole time, he was screaming and thrashing around in pain, and all he was getting was Zantac to control the stomach acid. They finally gave him a shot of morphine after he head butted me in the face in front of the surgical team and nearly blacked my eye. I had to restrain him several times because he was trying to bash his head in to the side of his bed. We couldn’t get his pain under control for days, and I frantically pressed the call buttons to get more pain meds or consults or something to help him. I was drawing at straws to try to make something happen. Surgery hated me. The nurses hated me. I was so frustrated and traumatized. It took several days to find a pain combination that worked for Spencer. It ended up being round-the-clock Tramidol supplemented by Ativan and Dilaudid. When the meds wore off, and he was awake, most of the time was spent crying. One day he cried so much that his voice went out. During this time, Spencer was NPO, which not only made me feel horrible that he couldn’t eat, but scared me because I was terrified that he would forget how to eat and would have to have another feeding tube placed. I had to tell the aides not to bring my food tray in he room because it would make him upset that he could not eat. Out of paranoia, I snuck him a drink or two just to make sure he would still eat. It probably wasn’t the best for him, but I had to know. I regretted it immediately because it would make the stomach acid flare up and his pain worse. Eventually he stopped caring. He stopped fighting for blood pressures and temperatures, things he hates. He became used to it, which killed me, because Spencer never goes down without a fight. After blowing every possible vein we could get an IV in, his dad called when I was taking a break from the hospital to tell me they were placing a PICC line. Spencer had never had a central line before then. They started IV nutrition shortly after having the line placed, after he had been NPO for four days. He lost a couple of pounds during this hospital stay, weight that we worked so hard to put on him. 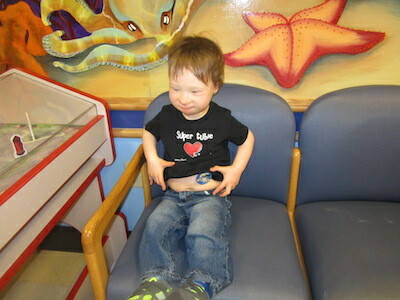 Spencer spent his fourth birthday in the hospital, in pain off and on. We didn’t tell him it was his birthday, as his dad and I agreed since he didn’t know we would celebrate after he was released. Child life came by and brought him toys, but respected our decision to not tell him. He spent a lot of the day playing, which I was grateful for, but it was still lousy. His skin just refused to heal. With the skin not healing, the surgeons couldn’t close the stoma. They didn’t want to remove the catheter because they felt like it would make it even worse. They consulted plastics, the burn unit, and any one they could to try to get the healing under control. The day after his birthday, they finally removed the Foley, something I had been trying to get them to do for a few days. They treated his stoma like a burn, as surgery said, because it essentially was a burn. He received a pressure dressing with Vaseline gauze, Mepilex AG, more gauze and a piece of Mepilex border. An attending came in to attempt to place a new feeding tube, and I nervously hid behind a corner to watch. I couldn’t handle seeing them do what I should have had our main hospital do in the first place to avoid all of this. The surgeon said it looked like it was trying to close on his own and he wouldn’t place another tube. I was relieved. We had a few setbacks, but the draining became less, and skin finally started to heal. We were hopeful that the stoma tract had become so damaged that it would close without surgery. While the stoma didn’t close, we were able to get his skin to heal well enough for surgery. At this point it had been 19 days since his tube was removed. 19 days of leaking and pain. The skin was so damaged that the surgeon had to close vertically instead of horizontally. He bounced back quickly after surgery, and while he was initially hesitant to eat , he eventually started eating like a champ again. Spencer’s story is important. It would have been pointless to let Spencer go through all this and not make changes. Had there been a different protocol placed for tube closure at the first hospital, he would have avoided two weeks of hell. I made sure his team at that hospital knew of this. I emailed his GI, who is wonderful and would have never removed his tube if he had thought for a second that it would get that bad, and I asked him to consider changing his protocol. I asked him to please get families who have had a stoma for longer than a couple of years to get a surgical consult before removal. He one upped me and told me that he had been in contact with both GI and Surgery, and was aiming to change the protocol of how stomas are surgically closed through both departments. It was his hope that this would be a protocol that would advance to all children’s hospitals nationwide. We’re working on it. Get a surgical consult before the removal of any G-tube. You want to be on surgical’s radar in case something goes wrong. Make sure your child’s GI and surgeon are on the same page before removal, and that both departments are there for you in case of removal complications. If the stoma is still leaking a lot after the first day or so, let the doctors know. If the skin around the stoma is breaking down, call GI and have an active plan to protect the skin. If it’s becoming clear after a few days that the stoma isn’t going to close and the skin is starting to break down, have GI replace the tube (if the stoma is still large enough) to protect the skin until surgery can be performed. A foley might be a short temporary fix, but shouldn’t be depended on for more than a few days. I had to write this. My goal isn’t to scare parents who have kids getting their tubes removed. It’s just a warning to be cautious. Those three weeks still haunt me. It doesn’t seem to haunt Spencer, who I doubt even remembers it all, but I’m still fairly traumatized and have a pretty nasty case of PTSD from it. It gives me comfort that by sharing Spencer’s story, families and doctors can make informed decisions about tube removal. I don’t want another child to go through what Spencer went through. His story needs to be heard.